If you are an on-prem customer, we will help you install SwiftEASe. Send us a mail at support@swift-ease.com to initiate that process. If you are a SaaS customer, then visit this page to register for the demo and set up a trial account for SwiftEASe.. Ensure that your product is listed in our list of supported adaptors. Get in touch with our SwiftSync team at swiftsync@digite.com on how to install SwiftSync and use it for integrating SwiftEASe with your product. SwiftEASe Overview and User training. Define a SAFe® Instance on SwiftEASe by creating a top level board. Read this Help topic to know how to create a Work Board. While creating a Work Board you can opt for a template based on SAFe 4.5 and 4.0. Read this Help topic to know about various templates available at every SAFe® level. Read here to know how to modify the Value Stream using the Board Editor and build a customized one. Create your own card type and enable them to be used in the Work Board. Create additional Work Boards corresponding to your needs as per the SAFe® levels. Follow the same steps as mentioned in step 2 and create additional Work Boards. Invite Team members to SwiftEASe instance. Associate SAFe® roles to the Team members. Understand what SAFe® Roles are and how you can allocate them to the team members. Allocate geographical location to each Team member. Get to know how you can assign location to multiple users at one go. Alternatively, the individual user can set their own location in the Profile Page. Create Agile teams and assign people to them. Define ARTs by allocating appropriate Agile Teams. Create an ART and assign teams to it. Start adding work cards at various SAFe® levels, such as Themes and Epics at Portfolio and Features at the Program-level Work Board. Read here to know how you can add a card in different ways. Understand the Parent-Child Card Hierarchy using which you can break a large card into several smaller cards, like a Feature card at the Program level Work Board gets broken into several smaller User Story cards at the Team level Work Board. Know how to define PI and Sprint and allocate capacity to them. How to create a PI from the top-level Work Board. Break a PI into a smaller iterative cycle, called Sprint. Define a capacity for the PI and Sprint before you start adding work cards to them. 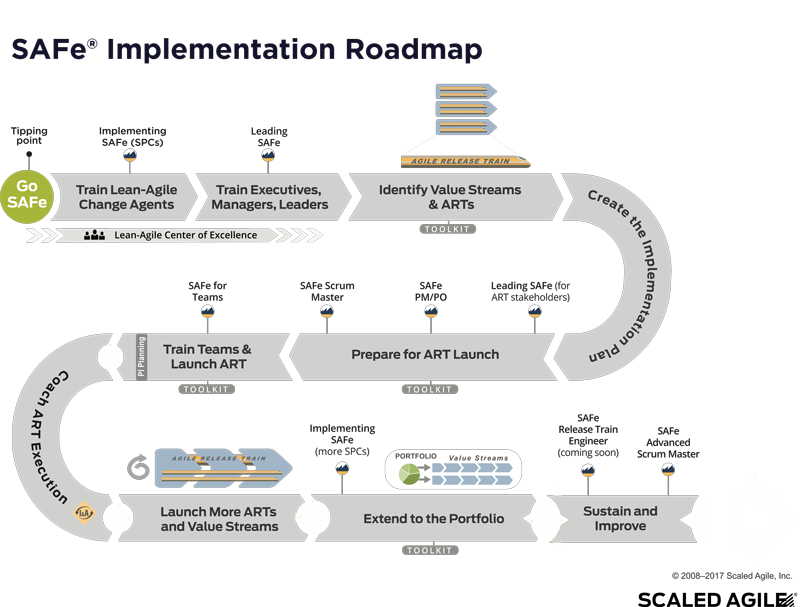 Allocate the Feature to respective ART and Agile Teams. Read the Assign PI section to know how you can first select an ART and Team before you allocate a Feature to PI Scope. Get to know how you can allocate a Feature to a PI using the PI page. Allocate the stories to respective Sprints. Get to know how to create a Sprint and allocate cards like User Stories into it. Have a detailed understanding of visualizing the work dependency using the Program Board. Define your Risk for each Team. Get to know how to capture the impediments associated with the PI here. Define PI Objectives and allocate planned Business Value to each objective. Know how to define the PI Objectives and assign Business Value (Planned and Actual) to them here. Execute work on your Work Boards. Drag and drop the Work cards from left to right in the Work Board and observe how the work progresses towards completion. Populate Actual(achieved) Business Value for each of the PI objectives. Read to know how to add the actual Business Value for PI objectives from this page and then compare the achieved Business Values of various teams using the Program Predictability Measure analytics. Read here to know more about PI and Sprint Burndown chart. Track the health of your ART and PI with ART analytics. Slice and dice ART and PI information with various analytics. Pareto analysis of your impediments for each Work Board. Get to know about the impediments from the Cycle Time Column-wise Average diagram. Identify the slowest Throughput column in your Value Stream in each Work Board. Get to know more about Throughput here. For each Work Board, perform Board Playback for the time period in the above step and identify why that happened. Identify whether you Flow Efficiency is improving for each Work Board. Know what is Flow Efficiency and how the efficiency is calculated based on the actual work time measured against the total wait time.